Whoa, where did our summer go? Our Duval County students start their first day back at school next week! Parents, we’re sure you’ll miss having the kids around so here are some last minute activities in #DTJax to make the last few days of summer count. Whether it’s a movie, a live show or a museum, these activities will let you and the kids stay out of the Florida heat! Summer readings are typically located at the front of the store but be prepared to get lost in a sea of books – they have two stories, wall-to-ceiling filled with all the titles you can think of. The bookshop and first floor cafe are open every day. If you’re looking for a specific book, don’t hesitate to call so they can put it aside for you! During the summertime, the Florida Theatre showcases Summer Movie Classics every Sunday. This weekend, enjoy a showing of Robin Williams’s Mrs. Doubtfire in celebration of the film’s 25th anniversary. For more information or to purchase tickets, visit the theatre’s website. Spark their curiosity by visiting one of #DTJax’s museums. The Museum of Science and History is currently offering half-off admission to all its guests before the school year starts. Take advantage of these fleeting summer days to enjoy Jacksonville’s most visited museum! The Times Union Center for the Performing Arts is Jacksonville’s main hub for live entertainment and other performing arts needs in the city. Toddlers and young children will be excitedto know that Paw Patrol Live! 2018 will be in #DTJax this weekend! The show has four performances lined up on Saturday and Sunday. Get your last minute tickets here. Keep the little ones out of the house the last few days of summer with these fun local favorites! After enjoying MOSH’s exhibits, hop on one of their riverboats for a tour of the St. John’s! The museum has partnered up with the St. John’s River Taxi to provide “a ride through history” every Saturday. Boats dock from the Friendship Fountain promptly at 4 p.m. For tickets or more information, visit the museum’s website here. Celebrate local businesses this Saturday from 10 a.m. – 3 p.m. at the Riverside Arts Market. The market is located in the Riverside-Avondale district under the Fuller Warren Bridge. RAM has something for the entire family with rotating food trucks, vendor booths, live entertainment and morning yoga. It’s also a hotspot for back to school presents for teachers! Creating things with the kiddos is a great way to bond and make the most of your time together before school starts. These family friendly spots are will allow you to collaborate and get creative! This is the perfect spot for hands-on activities with the kids. The Jacksonville Main Library has dedicated a huge portion of their main floor to promote creativity through music, art, technology and more. The librarians provide a variety of classes free to the public by partnering with local Jacksonville makers. Check out the Jax Makerspace calendar to see what they’re offering this weekend. Who doesn’t love sweets? Jacksonville’s candy emporium, Sweet Pete’s Candy Co. is offering a special Craft Soda and Candy Pairing until October 15th.Taste six sodas perfectly paired with gourmet chocolates and candies. There are currently seven time slots open this weekend. Make a reservation to guarantee a spot! These are just a few of the last minute summer activities that #DTJax has to offer. Enjoy the summer days and, for the kiddos, have an amazing first day back! Visit our website for a full calendar of activities this weekend. July is National Outdoors Month! To the surprise of many, the Jacksonville’s Urban Core is no stranger to outdoor activities. In fact, looking pass the high-rise buildings and architectural gems, downtown Jacksonville is home to not only businessmen, businesswomen, hipsters and musicians; but also outdoor enthusiasts. Though Jacksonville is known for its vast landmass that accounts for the city’s hiking and bike trails, endless beaches and internal waterways perfect for water sports fanatics; little know about the outdoor activities that downtown has to offer. In appreciation of the city’s limitless possibilities, here’s a short list of year-long outdoor activities you’ll find in #DTJax. If you’re looking for something unique and low-cost to do with friends and family, look no further than the Treaty Oak Park. Located on the Southbank of the St. Johns River, the 250 year-old tree is a popular spot for family gatherings, outdoor picnics and relaxation in general. In fact, growing up in Jacksonville, some of our locals no doubt have climbed up the branches at one point in their lives. For the bravehearts, the “octopus-like” tree provides 145 feet of branches for climbing. And if you climb all the way to the tree’s crown, you’ll find a 25 foot nook – perfect for naps and summer reading. If you’re not up for the climb, no worries. Because of the massive size of the tree, it gives visitors roughly 190 feet of shade – a good spot to get out of the Florida heat! Experience the city on a bike. One of the most popular activities in downtown Jacksonville is biking along the St. Johns River. The Northbank Riverwalk is the perfect cycling route to enjoy both an urban scenery and the cool breeze from the river. The Northbank is a wonderful 2 mile ride between the Jacksonville Landing and the Riverside Arts Market. You will even ride through the Love Locks Bridge – which not only connects the downtown district with Riverside, but also a known spot for couples to symbolize their ‘unbreakable’ love. For those looking for a longer ride, plan your route with the DTJax Map. You can’t go wrong with the three bridge loop over the Main Street, Acosta and Fuller Warren Bridges! Imagine this: seeing new angles of the city as you paddle under three of Jacksonville’s 13+ bridges, being swept away by the natural pulse of the River City. Though this recreational activity is not for beginners, if you are up for an adventure do not hesitate to book a tour with Jacksonville Kayak Company. Aside from cycling, the most common outdoor workout in the downtown district is running. Covering roughly four square-miles, the urban core is a runner’s world. From the riverwalk to the bridges to the hills, a workout junkie can get their full load of cardio while taking in the urban scenery. The USA Track & Field website offers an extensive list of running routes within the #DTJax boundary – including the Northbank River 5K. If you’re feeling adventurous and up for a challenge, try the Hart Bridge Loop 12K. Unity Plaza in Brooklyn, dubbed as Jacksonville’s “central park”, along with the Winston Family YMCA offers Tuesday and Thursday yoga sessions year-long. With the built-in waterfront and tiered seating, the Unity Plaza is the ideal central spot for sunset yoga. Now for the early birds looking for a healthy morning start, go further into Riverside and you’ll find yourself in Corkscrew Park commonly known for the weekly Riverside Arts Market. However, little known fact, before the hustle and bustle of the market traffic hits; Hot Spot Yoga’s Namie Rohack leads morning yoga from 9 – 10 a.m. every Saturday. These are just some of the outdoor activities in Downtown Jacksonville. Explore the city and discover more possibilities – they are endless! For more activities, visit our directory here. June is National Rivers Month. Take the time to appreciate and celebrate one of Jacksonville’s natural treasures: the St. Johns River – the longest river in the state of Florida at 314 miles! Since the 1860s, the St. Johns River has contributed to Jacksonville’s tourist industry with the establishment of hotels and countless recreational activities. To celebrate this old “San Juan River” (it’s old Spanish name before British acquisition), check out this list of year-long activities that you can enjoy along the St. Johns in #DTJax. Experience the city on a bike. One of the most popular activities in Downtown Jacksonville is biking along the St. Johns River. The Northbank and Southbank Riverwalks are the perfect cycling routes to enjoy both an urban scenery and the cool breeze from the river. The Northbank is a wonderful two-mile ride between the Jacksonville Landing and the Riverside Arts Market. You will even ride through the Love Locks Bridge – which not only connects the Urban Core with Riverside, but is also a known spot for couples to symbolize their ‘unbreakable’ love. For those looking for a longer ride, plan your route with the DTJax Map. You can’t go wrong with the three-bridge loop over the Main Street, Acosta and Fuller Warren Bridges! Opened in 1987, the Landing continues to be a local favorite as it goes into its 31st year on June 25. Located right on the river, this shopping complex is known for the various live entertainment and events that it hosts throughout the year. Some crowd favorites include the Florida/Georgia celebrations, the Annual Christmas Tree Lighting and Parade, the Summer Fireworks Series, riverfront concerts and cultural pride days like the annual Asian American Heritage Celebration. The Jacksonville Landing has one of the best views of the St. Johns River and is the perfect backdrop to 600+ events every year. Support local small businesses in your city! Small Business Saturday is a U.S. holiday that celebrates local businesses once a year. But with the Riverside Arts Market, you can celebrate every Saturday from 10 a.m. – 3 p.m. The market is located in the Riverside-Avondale district under the Fuller Warren Bridge – one of the best spots to experience the beauty of the St. Johns River. Regardless of whether you are a Jacksonville native or just visiting, Jacksonville’s “Best Farmer’s Market” is a must. Each Saturday is a different experience with rotating food trucks, vendor booths, live entertainment and morning yoga. Visit the Riverside Arts Market website to plan a true Jacksonville Saturday! Even some of the locals do not know about this popular downtown transportation! Park your car and cruise along the river. The St. Johns River Taxi has six pick up-drop off docks in downtown Jacksonville – including the Jacksonville Landing, Friendship Fountain, Riverside Arts Market and the Metropolitan Marina. So whether you are staying at the Doubletree on the Southbank or heading to a Jaguars game at the TIAA Bank Field, it is the ideal transportation to get around the urban core. Imagine this: seeing new angles of the city as you paddle under three of Jacksonville’s eight bridges, being swept away by the natural pulse of the River City. Though this recreational activity is not for beginners, if you are up for an adventure do not hesitate to book a tour with Jacksonville Kayak Company. These are just some of the activities to enjoy in the River City – not only for National Rivers Month but every single day. It is easier to appreciate your city when you know your city. So get exploring! For a detailed list of restaurants, shops and museums to enjoy in #DTJax, visit our directory here. Grades K-8th | MOSH presents Discovery Camp, where kids get a chance to have an immersive learning experience about animals, the planet, dinosaurs and other fun things in the realm of science and history. Children have a blast with opportunities to explore the museum and discover the universe in one of the nation’s few planetariums. The camp also offers extended care for working parents. Ages 4-14 | MOCA campers tap into their creative side and learn how to make art using all sorts of mediums with the help of experienced artists. Camp MOCA is an amazing opportunity for any child to learn about the contemporary art world while also making memories with new friends! Children have the opportunity to enjoy MOCA’s exhibits and become fully immersed in the world of contemporary art. Ages 5-15 | Boys and girls get a chance to play basketball like a pro and learn from the best of the best.The Jacksonville Giants have won the ABA National Championship in 2012, 2013 and 2016 along with winning other national records and awards. Campers learn the fundamentals of basketball, have a chance to be a part of a free-throw competition and engage in activities such as 3-on-3 tournaments, Hot Shot competitions and other loads of fun! Ages 3 to 15 | LaVilla School of the Arts‘ summer camp has a little something for everyone. Camp programs range from a variety of activities in visual arts, dance, drama, “Top Chef” science, comics, historical re-enactment and musical instruments. LaVilla School of the Arts offers specialty camps for different age groups, including Storyteller’s Camp for children ages 3-4, Explorer Camp for children ages 5-9 and Jr. Counselor’s Camp for 9th and 10th graders. LaVilla even offers Film Camp for movie buffs and aspiring directors, ages 10-14. Ages 6-16 | This is an opportunity any young football fanatic would not want to miss! Boys and girls get the chance to learn the basics of football from Jacksonville’s favorite Sharks players and coaches. 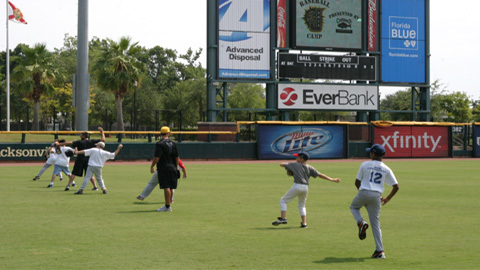 Ages 7-12 | Take your kid out to the ball game, or better yet, take them to a camp where they can learn baseball fundamentals from the Jacksonville Suns coaches and players. Kids get a ticket to a Suns game, a t-shirt, lunch and unforgettable memories. All ages | Got a sweet tooth? Come to #DTJax to learn how to make some of your favorite candies. Sweet Pete’s is offering limited summer classes that you won’t want to miss, including a a Soda Pop Shop Class and a Get Limed Key Lime Candy Class. Sign up today! There are plenty of other things #DTJax has to offer that you and your family can enjoy this summer. For more ideas of kid-friendly things to do in #DTJax, take a look at our events page and itineraries. Happy Summer Camping! Part four of our Downtown Itinerary series provides some fun ways to get the whole family acquainted with all Downtown’s amenities. Downtown Jacksonville is a happening place for kids! Check out this chronological itinerary, packed with kid-friendly activities available every day Downtown. Parking: Museum visitors can park for free in the parking lot across from the museum entrance at the opposite end from River City Brewing Company. Admission is only $6 for children and free for toddlers age two or younger with a $10 cost for accompanying adults. An annual family membership starts at only $80. About the museum: The popular Museum of Science and History (MOSH) on the Southbank opens 10 a.m. Monday through Saturday and Sundays at noon. The museum is packed with interactive exhibits just for kids, from the anatomy of a life-size blue whale replica in “Atlantic Tails” to experiencing a talkies movie theater in the “Currents of Time”. Included with admission are amazing MOSH science shows, where fun experiments are demonstrated with audience help! For “Creature Features” kids can interact up close with snakes, birds, turtles and more in the museum’s Naturalist Center. When you’ve wrapped up your visit at the museum, head out back to the beautiful Friendship Fountain, which leads to the start of the new Southbank Riverwalk. If you stick around Downtown until nighttime, the fountain will glow in multiple colors for its music and lights program everyday from dusk to 11 p.m.
Just past beautiful Friendship Fountain behind MOSH is the deck for the Jacksonville River Taxi, where you and the kids will get a kick out of riding across the St. Johns River to the Northbank. One-way fares will cost adults a mere $5 and the kids just $4. Rides begin daily at 11 a.m Tuesday through Sunday; closed on Mondays. If you and the kids are tuckered out from the museum visit, stay on the river taxi and take it for the entire loop around the riverfront area for a fun water ride around Downtown, getting back off where you parked at MOSH. If you’re up for more Downtown fun, disembark at The Jacksonville Landing. Hopping off the river taxi at The Jacksonville Landing will put you and the kids in the Northbank core of Downtown, ready to explore the stroller and pedestrian-friendly core for lunch. Lunch at the Jacksonville Landing is easy. 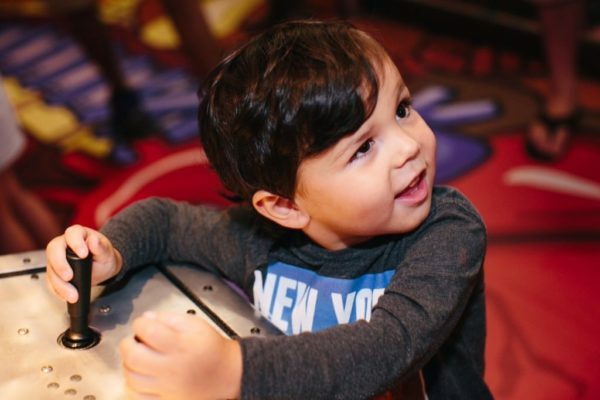 Choose from American Grill, Fionn MacCool’s, Chicago Pizza, Cinco de Mayo and even Hooters – all with kids menus and both indoor and outdoor seating. Be sure to visit their website for a full listing of stores, dining, events and concerts. Of course, after lunch comes dessert! Downtown houses a number of places to grab something sweet. Start with Peterbrooke Chocolatier (100 W. Bay St.) , then work your way up to Mocha Misk’i (209 N. Laura St.). Then tour Sweet Pete’s (400 N. Hogan St.) and see where all the magic – erm..chocolate is made. Kids can get in touch with their inner scholar at the Main library, which is located right around the corner from Sweet Pete’s near Hemming Park. The library opens Monday, Thursday, Friday and Saturday at 10 a.m., Tuesday and Wednesday at 11 a.m. and Sunday at 1 p.m. It offers a children’s department packed with books and other activities as well as regularly programmed events. Their kids section is overflowing with awesomeness, right down to the aesthetics. There’s a lounge area that’s created to look like a pond, complete with an alligator couch. The fourth floor map room is also an amazing feature of the library, especially for those future world travelers. Located right next to the Jacksonville Public Library the MOCA Jacksonville is great fun for kids. In addition to multiple floors of contemporary art the fifth floor is dedicated to the Art Explorium and contains 16 different stations for kids to learn about contemporary art. The museum also houses NOLA MOCA. This contemporary restaurant serves seasonal entrees as well as hand crafted grilled cheese, flatbread and pasta. MOCA Jacksonville opens at 11 a.m. Tuesday through Saturday and noon on Sunday with an admission charge of $8 for adults, $5 for students and free for children age 2 and younger. NOLA MOCA is open for lunch from 11 a.m. to 2 p.m. weekdays, and offers limited dining hours. The new and improved Hemming Park is a great place to have fun with the family while taking in the city. Food trucks are available and the park features live music every weekday from 11a.m. to 2p.m. The Imagination Playground Kids Station is open daily from 10a.m. to 6p.m. and offers a space for kids to explore and play. Every Monday there is a chess meetup from 10:30a.m. to 12:30p.m. for newcomers and experts alike. There are also other weekly and monthly activities. The first Wednesday of every month artists fill up the park for Art Walk from 5p.m. to 9p.m. Every third Thursday is Jaxson’s Night Market; featuring local farmers, local art and crafts, local beer and food trucks. Make sure to check out the events calendar to stay up to date on everything Hemming Park has to offer. During the week take the free Skyway back to San Marco Station or hop back on the river taxi to return to the Southbank any day of the week. Parking meters are free every weekday after 6 p.m. and all day Saturday and Sunday. Or if you prefer, check out the parking garage and lot options here. The Skyway, free, operates Monday through Friday from 6 a.m. to 9 p.m. and during special weekend events. For more information, click here. The Jacksonville River Taxi hours are Sunday through Thursday 11 a.m. to 9 p.m and Friday through Saturday 11 a.m. to 11 p.m; closed on Mondays. For a one-way ticket, fares are $5/adult and $4/children ages 3-12. Children younger than age 3 ride free. For more information and special events fare, click here. If you need assistance Downtown, our Downtown Ambassadors are here to help. Look for them in their orange polo shirts and pith helmets or call 904-465-7980. For more information on Downtown destinations, check out our online directory. Many Downtown destinations also hold various special events throughout the year. Be sure to check our events calendar often, or sign up for our weekly events e-newsletter. Need a change of scenery in your routine workout? Part three of our Downtown Itinerary series shows you how Downtown offers plenty of options indoors and outdoors to burn a few calories while enjoying Downtown’s scenery. There’s a built-in running track Downtown, and it’s called the Jacksonville Riverwalk. This scenic pedestrian pathway is a great place for short or long-distance running. Plus, chances are you’ll see other fitness friends along the way, especially in the busy late afternoon/early evening time-frame. Whether you’re looking for a shorter route or testing your endurance on a longer run, Downtown provides great paths to get in that exercise. Check out our #RunDTJax blog for examples of locals’ favorite spots (complete with a map of their path), as well as our list of running routes. Running the bridges is a popular Downtown exercise routine with its beautiful skyline views. With the new and improved Southbank Riverwalk, you’ll enjoy every scenic second of your workout. MapMyRun is also a great source for Downtown run routes – it offers a database of more than a dozen Downtown routes mapped by locals. Need a little green space to comfortably stretch and run drills? Metropolitan Park has plenty of room for you to move around in or sit and stretch on a comfortable lawn. The riverfront park is equipped with restrooms, benches and picnic tables, among other amenities and is open daily from 7 a.m. to sunset unless closed for special events. A Southbank option would be to take your workout to Treaty Oak Park, where there’s plenty of shade from the magnificent Treaty Oak to cool down your stretches and other workouts. Hemming Park is an open space right in the heart of Downtown where you can work on your balance and flexibility with yoga. Starting in March Yoga 4 Change and Hemming Park will provide free yoga classes. See the Hemming Park website for more information. Another hot spot for exercise downtown is Unity Plaza. From yoga to running to dance Unity Plaza has a number of activities that is sure get your heart pumping. Visit their website or their events calendar for more information. Cycling over Downtown Jacksonville bridges is a popular activity for city cyclists. North Florida Bicycling Club organizes routes that go all around Jacksonville, such as the Tour de Jax, which goes through the heart of Downtown. For more information on those routes, check out NFBC’s maps page. CityCycle in Riverside also provides great locations for getting to know Jacksonville, including group routes that go over the Acosta. Check the shop’s calendar for up-to-date ride information. You can also find a list of cycling routes on our website. Parking meters are free every weekday after 6 p.m. and all day Saturday and Sunday. Or if you prefer, check out the parking garage and lot options. The Skyway, now free, operates Monday through Friday from 6 a.m. to 9 p.m. and during special weekend events. Visit our page for more information. The Jacksonville River Taxi hours are Sunday through Thursday 11 a.m. to 9 p.m and Friday through Saturday 11 a.m. to 11 p.m closed Monday. For a one-way ticket, fares are $5/adult and $4/children ages 3-12. Children younger than age 3 ride free. Check out their website for more information and special events fare. If you need assistance Downtown, our Downtown Ambassadors are here to help. Look for them in their orange polo shirts or call 904-465-7980.